Katsu-hama has the juiciest pork cutlets I’ve tasted in midtown. Actually, dare I say in the city? The place is long and narrow, pass through the takeout sushi stand on your left, lift up the high hanging japanese curtains… and say hello to Katsu (Japanese Style cutlets) Heaven. You know it’s good when there’s always a line and 80% of them are japanese/asian. 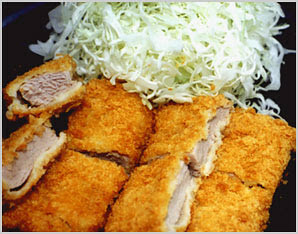 Order the Tenderloin Katsu first if you’re a katsu virgin (fried pork cutlet). But the fun part starts before your meal even gets to you. While your waiting, you get a tiny bowl filled with toasted sesame seeds and a wooden spoon for you to crush. This obviously releases the flavor of the seeds. I prefer medium grated, i like to leave a couple seeds for extra crunch later on. (This is good for a day when your angry and you just want to crush someone! it’s a little added bonus) To the sesame I add about 2 spoonfuls of Tonkatsu Sauce (their homemade version of this dark sweet and sour sauce, which includes onions, tomatoes, apples and spices). Now mouthwatering experience begins. The rice is steaming hot, and the pork cutlets are golden brown, cooked to perfection. Lightly fried and crunchy yet never greasy. The meat is always tender and juicy at just the right thickness. Dip it in the sesame and tonkatsu sauce and just enjoy. The order comes with cabbage salad, to that just add their homemade dressing, it’s a refreshing touch for your palette between a bite of the katsu and a bite of melt in your mouth rice. If you feel the rice to be bland, just ask for curry sauce on the side.